Designate an individual with responsibility for reacting to complaints and starting investigations. Have a clear system for logging the complaint and setting up a tickler file for further action and resolution. 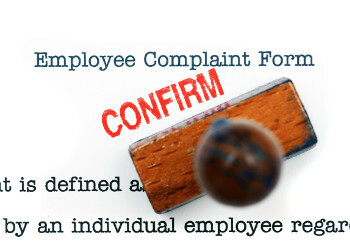 Immediately begin the investigation by getting details from the employee who complained. Explain what will happen next and urge her to report any further problems right away. Speak in private with any potential witnesses as soon as possible. Be sure to take complete notes. Make a determination as soon as practical and communicate that decision to the employee. If the accusation seems unfounded, explain that the complaining employee should still report any possible retaliation right away. Note: To solve he said/she said arguments, read our white paper, “Investigating Harassment: How to Determine Credibility.” Find it online at www.theHRSpecialist.com/whitepaper. If the complaint was substantiated, fix the problem immediately. That may mean disciplining those involved in the discrimination or harassment, transferring the guilty party elsewhere or taking some other disciplinary action. Then educate co-workers and supervisors about your organization’s expectations for workplace behavior.